The above was published by the American Federal Drug Agency in 2008. It shows the adverse side effects, of the anti-psychotic drug risperidone, trade name risperidol, since licencing. Well over $5 billion, in damages, and fines has been paid to plaintiffs, state, and local government agencies by the manufacturer. Please read in link the legal actions, against Johnson &Johnson in respect to Risperidone damage. In the UK, we do not have an insurance based system of healthcare, so such actions are effectively impossible. Read here the shocking expose of history of Risperidal in USA, and effect on children. I was unable to find similar information as obtained from FDA, from the UK Medicines & Healthcare Regulatory Agency (MHRA). Our UK’s system of censured, patient led, ad hoc yellow card warnings, and under used coroners inquests, make it difficult to even record a drug’s adverse. As a cross party UK political Mental Health Task force in 2016, advocates the medicalisation of mental ‘disorders’, now at 275 ,and risperidol or any antipsychotic is prescribed to children, here in 2018 is the latest position in USA on the corruption of child academic research and the connection to our third largest industry Pharma. Read it and see the danger in UK under the government policies and insistence that a quarter of school children suffer a diagnosable ‘disorder’. Long term autistic, and those with behavioural problems on Risperidone, are often described, as physically ill, and it is most likely that the drug is causing this. Just check out the side effects that could make healthy autistic/ leaning disabled/ mentally disordered, physically ill. Similarly, it is documented, that the drug itself, can cause psychosis and seizures . In the UK, 2000 children, and 110 toddlers are prescribed Risperidone, despite these adverse effects and this has increased. How his research could show effectiveness of Risperidone in pre school children for ADHD, Bipolar, Psychosis. How could anyone diagnose these disorders in 3 years olds ? And why would they want to ? And, on what basis would they decide the treatment worked, and how could they determine the future adverse effects on toddlers? 10% of our total NHS budget is on psychiatric prescriptions. Some as young as 4, given this powerful chemical lobotomy/ neurological suppressive as if sweets with school milk, and it is put into their fruit shoot drinks. And ensures a ‘learning difficulty’ due to its proven effect on grey matter and brain shrinkage..
Research shows it causes learning disability, psychosis, fits and unknown physical changes. 93% of Learning Disabled in institutions are routinely medicated with Risperidone or similar antipsychotics. Recent research in 2015 shows it is used to control behaviour alone..
And evidence, that cognitive behavioural therapy works as well as medication. Children in state care, are given behaviour controlling drugs, mainly Risperidol, although Beverley Hughes, a former secretary of state for children, schools and families was unable to provide details of their use. As they were “not collected centrally by the Department”. (Hansard 28/4/2009). Our MHRA is paid for by the pharmaceutical industry, and largely consists of ex pharmaceutical company experts. And autistics will find it impossible to communicate side effects, let alone, have them acknowledged and recorded. Only those that manifest physically, will be discoverable- drooling, restlessness, crying, poo incontinence, impaction, slowness, imbalance, stiffness of joints . And state druggers, do not do physical examinations and care is by ad hoc, itinerant, prescribed workers. Anti-psychotic medication is part of an accepted, enforced system of autistic care. Which produces a huge lucrative, reliable, and increasing market, and GP’s are now paid by interventions and prescriptions. Parents and the autistics are given no effective choice. If, 18 or over, the autistic is deemed ‘incapable’ of refusing treatment under the Mental Capacity Act, if under, parents are forced to medicate on threat of removal of their children by care orders. Despite public warnings, from experts, at September 2015, this is still the position in the UK, and no one, is attempting to stop this abuse of our most vulnerable. The pharmaceutical industry is our third largest. Profits support our economic growth, and, appear, more important, than its people commodities. NICE guidelines, do not require a check, or even audit, of the amount, or type of drugs, used by state agencies. And, are merely guidelines which can and are ignored. Prescriptions are at the discretion of individual GPs, and Children and Mental Health Service teams. Managers of care homes are given a discretion under NICE guidelines, to administer drugs as necessary. Regulations under the Mental Capacity Act 05 allow any clinical trial of any drug, or combination, on those deemed ‘incapable’ under the Act. A godsend, to the pharmaceutical industry, as publication of trials, result in drug licences. So, in this secret, silent, world of state enforced medicine, on those unable to communicate, how can side effects, even be observed, let alone, recorded? Even when the side-effects kill. In 2011, the privately run St Andrew’s mental hospital, in Northampton, only appear to have started investigating deaths, after 4 patients died, in less than 7 months. And, the fourth patient’s, concerned family, instructed a lawyer. The report to the Care Quality Commission, revealed, a recognised side-effect, of a 41, year old patient’s antipsychotic medication, a faecal impaction, had developed over many months, and, eventually forced his internal organs to shut down, and, an excruciatingly long, and painful death. The report, had not been revealed in the first coroner’s inquest. The coroner found systemic failings, contributed to the death, and the hospital’s failure to complete a physical examination, was a “missed opportunity”. A physical examination, is basic medical care, of any patient. But absolutely crucial, if you have a patient kept continually on high dosage antipsychotics, who is unable to communicate. And, you are supposed to be ‘treating’, for a payment of £4,500 per week, tax free. It is not just, a ‘missed opportunity’. What is now being done in St Andrews, to avoid future deaths, of their 600 patients, detained under the Mental Health Act, worth 2.5 million per week, tax free? How would such ‘staff’ notice ‘deterioration’, in heavily sedated, bed bound, mentally disabled patients? With 4 deaths in 7 months, and the lives of 600, at stake, the very least the CQC should have done, was to make frequent medical assessments, mandatory. The reason for these deaths, would not have, been discovered, or reached the media, had the deceased, not had a concerned family, able to instruct a lawyer. Under the Mental Capacity Act, as opposed to the Mental Health Act Local Authorities can, and often do, stop all family contact. 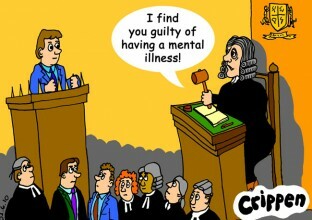 The Court of Protection gags all information of the deaths or services of the adults under its protection via the MCA. Why, in any event, is this drugged encagement, deemed ‘medical’ treatment? Why are its providers, allowed to charge such extortionate amounts from the public purse, tax free? And why, are these vulnerable, people, forced to live as tortured cash, and pharma cows for life? In 2008, a large number of yellow card warnings, cited risperidone, as cause of death in the autistic, and learning disabled. Today, with reports of 3 a day dying, this must now be far more. In 2007, the only treatment offered for my daughter by the NHS, was risperidone. The obvious reasons for her aggression, and unhappiness,a faecal impaction, and inappropriate school, deliberately ignored. In 2007, I complained to CAMHS, of my then 10 year old daughters side effects, crying, incontinence, breathlessness, black rings under her eyes. CAMHS informed, they could not have been caused by her risperidone, because they were not on their list of side effects. On the back of such trials CAMHS assessment centres were built throughout UK providing 12 week assessment ‘pathways’ that only resulted in antipsychotic medication.Termed in literature as ‘control without restraint’. My daughters unhappiness in her NAS residential school, and a second impaction, were then ignored again in 2012. Despite, her impaction 3 years earlier, her aggression and a 48 bruise restraint trigger. And her parents, spending over a year, flagging these up, to NAS, CAMHS, safeguarding authorities, and an independent reviewing officer, and demanding her physical examination. Issy was not physically examined for an impaction. Instead she was given anti- depressants, and build up drinks, both, known to cause constipation. Issy’s PTSD, evidenced by distress, and, repeating the abusive comments of NAS carers, at that time in 2012 was used by CAMHS, NAS, and social services, as evidence of psychosis, to justify a 112 week assessment in a CAMHS care pathway centre, and permanent respiridone medication. This horror would have happened, had Issy not herself, had enough, and been 16, too old for a care order. And, as, not a danger to herself, or others, difficult to section under the MHA, without our consent. Refused to return to her NAS ‘home’, where, had she, it could not have been long, before she succumbed, to a long and painful death. But CAMHS, by then, would have pocketed £60,000, and NAS, dependent upon how long Issy lived, £3,500 per week, tax free. Thankfully, Issy saved her own life. And,once home, we had her physically examined by our GP, and, cleared her denied impaction, and, removed two undetected, rotten teeth. Her aggression ceased, except for the PTSD. The figures in the FDA table above, speak for themselves. 74% of the adults, and 79% of the children affected, died, or were hospitalised, with life threatening reactions, some left permanently damaged. With 7.8 million prescriptions of risperidol in 2007-8, the horror of the human suffering, these statistics, and Jansen’s 1. 72 billion civil claim settlements represent, is difficult to comprehend. And for what, expensive chemical lobotomy sedation, with no long term gains? Despite these shocking adverse effects being revealed by the Federal Drug Agency, the death, and, suffering wrought, by spin, incentives, and high octane sales, grew worse, not better. Up until 2007, the Federal Drugs Agency had repeatedly warned Jansen against promoting Risperidone for children. Instead Jansen instructed its sales representatives to call on child psychiatrists, and children’s mental health facilities to aggressively market Risperdal, as safe and effective, for the symptoms of various childhood disorders such as attention deficit hyperactivity disorder, oppositional defiant disorder, conduct disorders, obsessive compulsive disorder, and autism. 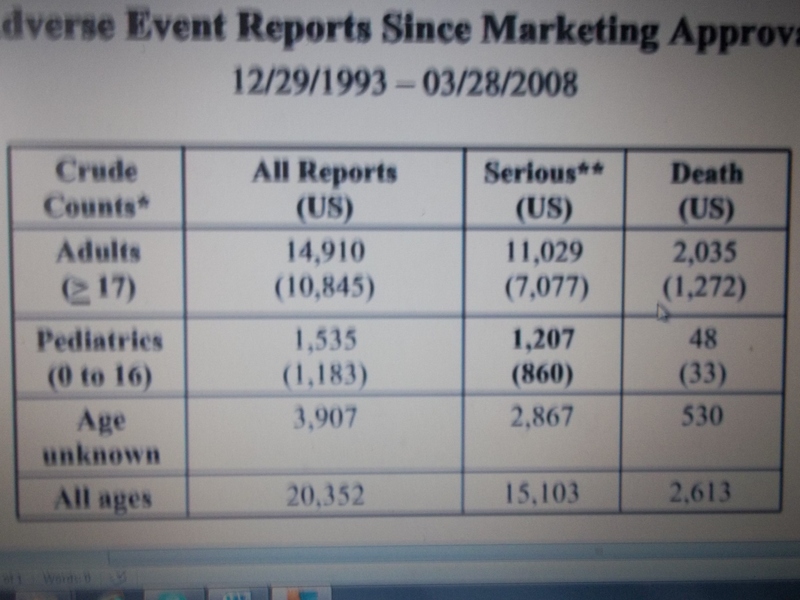 And, then in 2007, the FDA, itself, despite the known side effects, approved risperidol, as effective, and reasonably safe for the studied indications in pediatric patients. And thus ensured even more deaths and permanent damage as shown in the table above dated to 2008.. Eventually leading in 2013, to Johnson and Johnson, paying out 2.2 billon dollars, in one of the nation’s largest healthcare fraud settlements in U.S. history, for inter alia, the promotion for uses not approved as safe and effective, and payment of kickbacks to physicians, and to the nation’s largest care pharmacy provider. Think of the billions, that should have been paid out to parents in the UK, but our NHS system precludes this from happening. The exposure of this fraud, was forced by private health insurance company claims, not existing in our publically funded but now privatised NHS. Unlike the USA, we have no insurance companies acting for us, protecting themselves from claims of those medicated. 20 years ago the USA started, psychiatric drugging of their children, and now one in every 15 enters adulthood, with a serious mental illness. And half of all those in foster care, are now on prescriptive medicines. There is research, and anecdotal evidence from carers, that the use of respiridone can itself, cause psychosisin the autistic, justifying its continued use. So the drug causes a serious mental disorder you did not have, as an autistic, learning disabled, ADHD, bipolar person. In 2013, Janssen-Cilag, applied to the MHRA for a license for risperidone use for ‘irritability in autism’. But then, the company refused to accept an extremely lucrative UK licence, as it was conditional upon safety monitoring. The business risk, of monitoring safety, which should, in any event, be, the paramount concern, outweighed, a lucrative UK licence. Yet, care pathway CAMHS assessment centres, have been expensively built, throughout the country. They are the only option for the under 16 autistics, mentally disordered/disabled with behavioural problems. So what is the National Autistic Society’s advice, on the use of Risperidol ? Risperidone, is not licensed for irritability, repetition, or hyperactivity. And, the NAS website link, into their Research Centre, contains little, or, no evidential support for NAS recommendation of Risperidone as the main/only treatment for autism, let alone a significant amount of research. Even after 2008, when the European harmonisation of indicators of side effects, restricted its licence, to short term sytomatic treatment for persistent aggression. Its long term use in children under 18, even for schizophrenia, or bipolar disorder, is not licensed. There is not, a ‘significant amount of research evidence’, quite the reverse, two recent studies warn of the serious side-effects, http://www.ncbi.nlm.nih.gov/pmc/articles/PMC4074627/. The risk of sudden heart failure, has already resulted in the black boxing of the drug, for the old http://www.drugdangers.com/risperdal/black-box-warning.htm. Evidence from relatives however shows that similar antipsychotics and even Risperidone are still regularly administered in care homes for the elderly. We must legislate for such a warning and the end of the standard use of this and other antipsychotics, on our young, most vulnerable, and, least in need of such medication. NHS’s largest spend is n drugs for the central nervous system– mental health with a staggering £1.95 billion in 2011, the 0.1% ‘fall’ spin is due to removal of two patents.